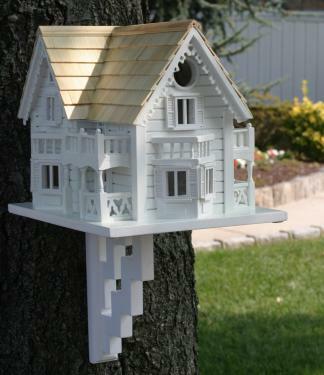 Intricately decorated birdhouse with minute details, including gingerbread roof trim, Porticos and shudders. Will accommodate wrens, finches, chickadees, nuthatches and titmice. Topped with pine shingles and an outdoor, water-based, non-toxic paint. A removable back wall and a mounting bracket is included.